You can flip back and forth through the playlist using the small arrows. It is named Despite the Downturn: An Answer Album, the title phrase taken from a sentence in McArdle’s article. For my (written) critique of McArdle’s piece, go to these two links: disquiet.com, disquiet.com. I made some additional comments at archive.org, where the audio is housed. Updated May 4, 2010: After the initial seven tracks, an eighth by My Fun and a ninth by Jettatura were added. Updated May 17, 2010: A tenth track, by Simon Lott and the group Beta Collide, coordinated by Beta Collide member Brian McWhorter, has been added. Please note that the links below in this post will interrupt the streaming audio. Direct links to download (as well as an interface to stream) the individual MP3s are provided. Track 1. (Duration: 06:26.) "Adieu for Industry" by Sighup, aka Steve Hamann. Artist's Description of Piece: "I chose to interpret actions and elements contained within the image as the basis of musical instruction. The key elements for me were the few remaining notes on the foreground staff before they were burgled, the jumble of notes in the bag, the noise and detritus scattered about the burglars, the orange swash, and the impression of musical remnants. The result is repeated figures of a few notes, clashing in layers, covered in a haze of recording and processing artifacts, and resolving in a swell. The sounds I used are a combination of found recordings and original material, the swash of orange/swell at the end is a loop taken from a public domain recording of Beethoven's Adieu au piano, altered with a granular processor. The rhythmic noise is taken from the beginning of an old cylinder recording. The whole composition was created in Audiomulch." Track 2. (Duration: 05:36.) "StaffGrabbing" by C. Reider. Artist's Description of Piece: "Broadly, my concept when planning/recording 'StaffGrabbing' was to portray the disorder of a system that may once have been in order, and a 'rude intrusion' that hastens the breakdown. The two sound-sources I chose to use were a recording of solo piano, and a hip-hop beat. The color wash in Jeremy Traum's illustration gave me an excuse to start with a nice drone extruded from the piano sound-source, because, come on, who doesn't like a nice drone? In a separate process, the piano recording was temporally distorted by shuffling chunks in an audio editor; this edit was run through a filterbank. The hip-hop beat was also temporally distorted with nonlinear time-stretching. I like the result because it evokes the lazy, slouching walk of someone with their pants hanging down too low. At the end, the notes all pile up in a big distorted mess on the floor." Track 3. (Duration: 02:15.) "Discard" by Moldilox, aka Joseph Luster. 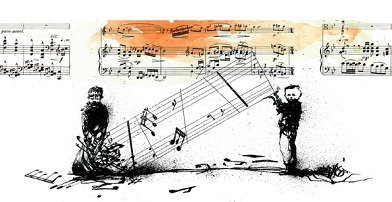 Artist's Description of Piece: "I thought this was a really cool and interesting project, and wanted to try my best to both capture the illustration and the music that's a part of it. Now, I can't really read sheet music, and my "training" has pretty much all taken place in the land of beeps and boops, so there was a bit of a wall to climb. I decided to start by making a song based on the illustration, which just kind of came naturally and quickly. After I had most of that laid out, someone was kind enough to transcribe the sheet music into simple notes my ape brain can process, so I tracked (the majority of) those chords and used it as an opening to the track. All of the work was done using Milky Tracker (OS X) and a variety of sampled instruments, mostly from NES games." Track 4. (Duration: 05:57.) "Upend (Based On Traum)" by Mark Rushton. Artist's Description of Piece: "It's an intentionally 'quiet' mix. That's in response to the article. I believe today's homogenized pop played on FM radio stations is compressed to death and over-modulated so that even a good tune can be ruined, but since I don't compose pop songs it doesn't really matter to me, so I do a 'quiet mix.' The overall piece is 'inspired by' the illustration rather than an attempt to reproduce. Everything in the collage was recorded outside: the field recording of the kids is from last summer, and the looped electronics are from a public performance I did in Iowa City in 2005 which was altered and mixed live. I took three sections from the original 2005 recording and kept one of them normal, while other two were pitched at one and two octaves lower than the original. There are some other loops in there, but these were the main inspiration. The live electronic loops tend to repeat, but in each round of looping I believe I tried to alter it somewhat when it was live (back in 2005) -- this, to me, is akin to seeing the notes run off the page and then picking everything back up on the left side of the page. And when I read these notes, I'm not exactly sure each time how they're supposed to go (it's been a while since I had to read music). The 2005 live performance loops were recorded off my Bose L1/B1 with binaural microphones into a Sony Minidisc recorder. The 2009 field recording loops were done with a Zoom H2 in stereo surround mode. Alterations and final mix were done in Sony Acid Pro using Grado headphones." Track 5. (Duration: 02:37.) "Weight Mass Density" by NQ, aka Nils Quak. Artist's Description of Piece: "The foundation of the track is a set of Risset tones, which I thought were a nice ”“- although quite obvious ”“- analogy for the picture of decay. Even though they appear to be always falling in pitch, the sensation is just an illusion as the pitch always stays in between given frequency borders. The Risset tones were re-recorded through a set of different granular processors to extrapolate the idea of a sound falling apart. The final piece is a document of decay. But more precisely, it's a still life of a sound in decay. Frozen, yet moving, and producing new structures, cracks, fragments, and pieces ”“- always in the process of falling apart and never reaching its end." Track 6. (Duration: 05:27.) "Atlantic Sickness (For Nomad Palace)" by He Can Jog, aka Erik Schoster. Artist's Description of Piece: "This piece is a construction from the information I found (and imagined) in the Atlantic illustration: chords and pitch sequences, raw jpeg data, and my impression of the visual tone were the primary ingredients used. Soundhack converted the jpeg data into raw audio; I used Max/MSP to translate this audio into control data to drive Propellorhead's Reason and to manipulate the pitches I transcribed from the image as well as filter the sound directly with the audio generated from the image data; about thirty minutes of improvisation with this patch setup was dumped onto cassette tape and back and then arranged in Logic Pro and finally edited and processed in Amadeus Pro mostly with Apple AUs and the Merzbizer pluggo by Akihiko Matsumoto. This was an exercise in free play with sound data and intuitive structure which I hope will be interesting to other listeners. I took more risks sonically than usual -- inspired by my fearless eight- and nine-year-old computer-music students. This is dedicated to Nomad Palace (aka Nate Zabriskie), who really needs to re-release his Atlantic Sickness album at some point." Track 7. (Duration: 00:39.) "Minuet McArdle" by Tom Moody. Artist's Description of Piece: "I was curious to hear if the tune was anything I might recognize (it isn't). I transcribed the notes by hand into a MIDI score editor, set for the same key and time signature as the score in the drawing. I included a random middle section for the "freak out" where Traum's musical staff breaks down. I "played" the notes by letting the editor directly trigger commercial piano samples (a Steinway grand) at a moderate tempo. I know it's wrong on a lot of levels but does attempt to take the actual notes into account." Track 10. (Duration: 00:55.) "That's a Traum! [Brontosaurus]" by Simon Lott and Beta Collide. 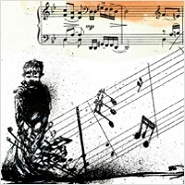 Description of Piece (by Brian McWhorter): "This piece went down like this: asked by Marc Weidenbaum to realize a cartoon as though it was a graphic score; through a conversation with the cartoonist Jeremy Traum, discovered what musical score he excerpted in the graphic; I recorded snippets of said copy written piece with Eugene pianist Matt Svoboda; found additional samples to use of the tune (which I felt was almost a requirement given the subject); assembled a rough track; was emailed an incomplete track for a totally different project from New Orleans drummer Simon Lott; combined the two tracks; realized that the result was not a realization of the graphic-as-score, but rather, the music that must have been playing in the cartoon itself." Beta Collide is Patrick Cronin (piano, subwoof), Robert Nash (guitar, electric bass), Simon Lott (drums), Brian McWhorter (vocals, trumpet), Matt Svoboda (piano). About the Cover Image: The image on the "cover" to this collection is a quadrant of the original Jeremy Taum illustration that accompanied the Atlantic article. If this is the result, maybe The Atlantic should print more myopic articles. Grains of sands?